Inflation and the rapid fall of Iranian currency value have made it impossible for minimum wage earners to afford their daily expenses. Labor activists are now calling for a review of the minimum wage. Head of Islamic Labor Council of Tehran Province has announced that a request to the Supreme Labor Council to review the minimum wage is in the works. 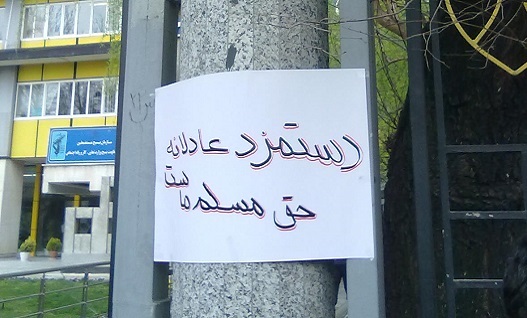 A slogan left by Iranian workers in front of the Ministry of Labor saying: A fair wage is our right. A spokesman for the Parliamentary Planning and Budget Commission has also described the situation of workers “under hunger line” stressing that working-class households are “facing hunger” due to the low minimum wage rate. In March prior to the Iranian newyear, independent labor groups had urged the government to set the minimum wage at 5 million Toumans (less than $700 USD) a sum that was based on the monthly needs of a 3.3 person household. Meanwhile, state labor groups had proposed the rate of 2.7 million for a monthly minimum wage (around $300 USD). Despite the proposals, the minimum wage was set at 1 million and 116 thousand Toumans (less than $200 USD). The labor minister maintained that a strained manufacturing sector and the dire economic situation did not warrant a higher rate for minimum wage. Now the Supreme Labor Council is saying that the government has to oblige employers to accept a higher rate. Meanwhile, the Head of the Islamic Councils Centre says the increase in the minimum wage is not the answer because employers are also hurting from the economic situation. He says the government has to take some of the burden off with tax relief and supply of raw materials. He adds that the expense of putting stress on workers’ budgets is the rise in housing rent. The labor minister has not reacted to the recent concerns regarding the minimum wage. Meanwhile, recent reports indicate that workplace accidents are claiming the lives of six workers on a daily basis. In addition, hundreds also suffer from major and minor injuries. The government blames employers in this matter and fails to monitor the workplace safety. On June 27 fire in Abadan Petrochemical plant killed a worker and injured 18. On June 26, in Urmia, a construction worker fell from a six-floor building on the worksite and was killed on the sport. One day earlier, four workers in Khorasan Province died from monoxide carbon poisoning during a well-digging project. And the list goes on. The Ministry of Labor maintains however that the labor regulations established by the government are adequate, however, employers fail to observe them. The government reports 2000 workplace deaths each year but this does not include the “white contracts” signed by immigrant workers who forego the right to claim insurance or file complaints against the employer for workplace safety matters.